I took my first yoga class at a groovy New Age health spa many years ago. Afterwards, I felt totally relaxed and at ease. At that point, I was barely taking care of my inner voice. I wasn’t really aware of the turmoil in my mind. I did yoga sporadically at the gym, on vacation, and on little retreats. After and during classes, I felt great, but I was not consistent; when there was a PTA meeting or a hectic holiday season, I forgot about my yoga practice. By the time I had my fourth child, parenting had begun to overwhelm me on the inside. My low self-esteem was getting the best of me. Even though life appeared peachy on the outside, I was feeling quite lonely on the inside. I sometimes felt like I was going through my days not fully engaged. I worried about the next day and all my errands and tasks rather than being present in the moment. Then, a dear friend brought me to a yoga class at a church, and I was instantly touched by the teacher’s dharma. Later, I took a class at a local studio, where I truly found myself at home. The teachers taught off the mat. I started to let go of thinking about how I looked doing the postures and really started to look within. Without the teacher doing the poses in front of me for most of the class, I really softened into a new aspect of the practice. I had always compared myself to others and did not think I was as good as I could be. I was self-critical, even about yoga in the beginning—until I landed at my yoga home. A year later, I was in teacher training! I had been a healer, a nurturer and a “take care” kind of girl ever since I was little. I was always a good listener with family and friends, and I naturally continued that by helping and taking care of others as a wife and parent. But I never felt self-worth—that is until I began to unravel through in-depth practice and study of the sacredness of my spiritual self through the ancient art yoga. At one point, my life began to spiral into the unknown when my nervous system literally shook me up with almost every symptom of chronic Lyme’s Disease. My yoga practice became more important than ever. It helped me overcome physical challenges in ways I never imagined possible. I continue to get in touch with who I am, and while things still have not slowed down, my toolbox is much fuller now. I have the gifts of mindfulness, deep reflection with mantra, and Kundalini yoga, which all allow my perspective on life to be much clearer. I’m thankful for the battles of low self-esteem and health issues because these obstacles have guided me to get to know myself and to quiet my inner voice so I’m often floating in peace in the midst of commotion. As my practice has deepened, I’ve come to understand and trust my intuition as a teacher and healer. By learning to know myself, I’ve also learned how to serve others with honesty, integrity, commitment, compassion, and heartfelt presence. My goal is to continue to learn and to nurture myself and my students so that every time we roll out our mats, a unique yoga experience will unfold that speaks to each of our individual needs. Yoga can help us tap into our true nature, allowing it to shine brightly, guided by the lotus of our hearts. Marla Sacks is a 200 & 500-hour registered yoga teacher (RYT). 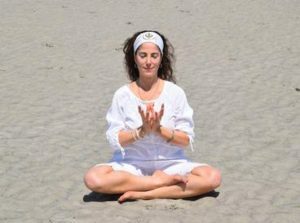 She is a Kundalini Research Institute (KRI) certified yoga teacher with a KRI level 2 module in Conscious Communication and Therapeutics from Golden Bridge Yoga, NYC. Marla is also a reiki practitioner and a Sat Nam Rasayan® healer through SNR Foundation, Mount Shasta, CA. She teaches and offers therapeutic healing services in northern New Jersey. Her website is www.marlasacks.com.